(349/8) 60 Leavenworth; Classic Apartments. Storefronts and apartment building with sixty-eight rooms and twenty-eight baths. 4B stories; brick structure; galvanized iron cornice and three-story bay windows; two-part vertical composition; Renaissance/Baroque ornamentation; vestibule: terrazzo steps, marble walls with aedicules, cornice molding; lobby: wainscoting, beamed ceiling, cornice molding; storefronts: bulkheads, vestibules, angled display windows. Alterations: security gate (artistic work added after period of significance), aluminum windows, storefronts completely remodeled. Original owner: Grimm. Architect: T. Paterson Ross. 1923. (349/6) 54 McAllister Street; Dorothy Day Community. Apartment building; 8 stories; built after 1984. Site of Colonial Theater. (349/4) 36-44 McAllister Street; Civic Center Residence. 1922. (349/1) 1 Jones Street; Hibernia Bank Building. 1892. The massive granite structure on the right is the UN Plaza Federal Building. President Theater, 1948. First opened as the Colonial in 1905 (rebuilt 1906), the theater’s name changed over the years to the Savoy, Oriental, Plaza, and President, its final incarnation. Following the theater’s demolition, it was replaced by the Dorothy Day Community, housing for seniors. 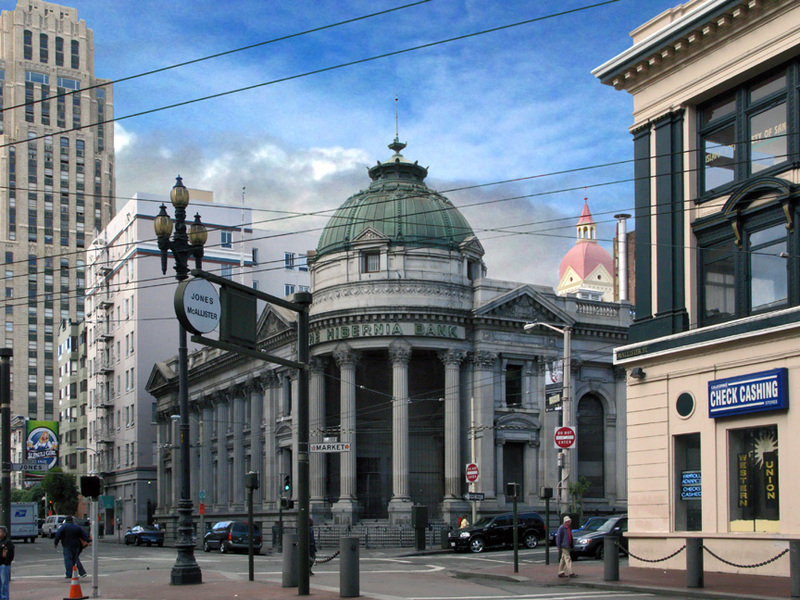 The President was one of several venues in the Tenderloin district that at different times featured live theatrical performances; others were the Larkin Theater at 816 Larkin, the Tivoli Opera House on Eddy Street, and the Casino Theater at Ellis and Mason. The Larkin Theater (renamed the New Century) is the only one that remains. The Number 5 streetcar line was replaced in 1949 by the 5 Fulton trolley line.